Following Bryan Brock's death no Gathering was formly organised, what with that fact and the event being cancelled in 2010 momentem to have a gathering fell flat. A number of Allens did group together at the BCNS rally at Pelsall in June but this was not organised but has given us an idea. Without much organising just some advertising an Annual default Allens gathering could be tagged onto the annual BCNS Rally. 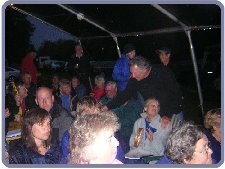 Chairman Bryan Brock on the 2003 gathering. Again, a big thank-you to Stan Stephens and his team for their jazz. Another big thank-you to Tony Jones for organising the bar. 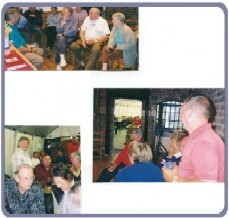 Some photographs of the 2003 gathering; the Photo's will enlarge if clicked on. The format is a scan from Bryan's scrap book hence the different groupings. Most of the photographs taken at various times over the Saturday, by Bryan before and after the main entertainment. We all laughed so much at the main act that everyone forgot to record the moment, so the photographs don't show the large number of people who attended the event. KINGS BROMLEY WHARF MARINA: Bridge 54 on the Trent & Mersey canal. Well this gathering was the first, off the Birmingham level and it started as most events and holidays this year with wet conditions. 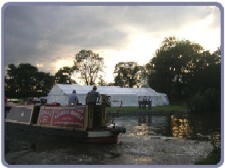 The BCNS marqee and new mobile bar where erected on grass land just near to the entrance to the marina. 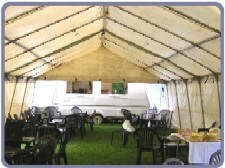 It was the first time the bar and tent had been erected together, in the event the two went together well and yet another facality was added to the BCNS and ALLENS Register list of equipment. Boats gathered along the canal as the new proposed extension to the marina, where it had been planned to hold the rally had not been completed. Plan B was used as described above, the normal moorers at the marina made us most welcome and Ray gave us the use of an ex pottery boat believed to be the Milton Maid. 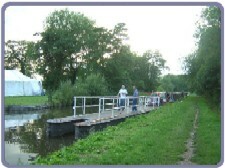 This craft was used as a floating bridge so access to the site could be made by mooring it across the canal, providing plenty of entertainment when it had to be removed to let boats past. This proved to be a popular addition with most boaters finding it an excellent place to drink when on the Friday night the weather changed into a pleasant evening. Saturday was spent talking and visiting until in the evening the Stan Stephan's Jazz band arrived and the barbercue's were lit. Bob with Sybile and John with Hazel attended and a very pleasant evening was spent with the open invition to all the moorers at the marina being well attended. The weather played its part being warm and dry. Ray Bowen and his guests arrived by boat just as the sunset but soon got their meals cooked. Sunday came too soon the tent and all the structures were taken down very quickly by an army of helpers, so the circus moves on, where to next year? 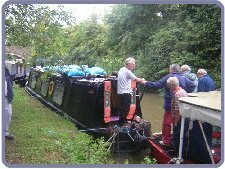 Thanks to the BCNS, Stan Stephan's, Tony Jones for running the bar(a joint BCNS/Coombeswood Canal Trust venture), Ray Bowen for the use of the site and all his help in allowing boats to attend before hand. Joan and Roy Kenn for supplying the buffet. Jean & Barbara wardens at the marina for their help and keeping us in order. Coombeswood again for letting us use their truck to transport all the gear. And lastly to everyone who attended especially the boaters who had travelled from a far. Just a few pictures of the site, The Editor again was enjoying himself to much and forgot to take pictures during the evening. After last years gathering off the BCN no other sites presented themselves that could be supported by the logistics needed to put on a rally, so Brian was forced into again going for the BCN. Recent changes to the Merry Hill site favoured by many, have made this venue very difficult. Pontoons have been placed in the lagoons and the owners charge for mooring there. The pontoons could be removed but a cost would be involved and coupled with the problems with obtaining a drinks licence the site has become untenable. 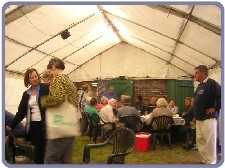 So it was the pumphouse again with the marquee and meeting hall again being linked to make a large entertainment area. Boats moored ago the Titford Canal on the new moorings, as the pontoons on the Tatbank branch are now full of BW permit moorers. Again the rain threatened to spoil the proceedings, but failed to damped the spirits of the crews. On the Friday night the bar opened and a slide show presented by Roy Kenn was shown. 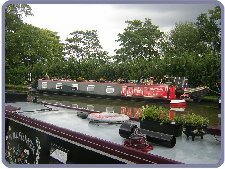 Both John and Bob Allen attended along with John and Jim Horton, along with many members who had moored at the yard over the years. The slides covered many years and showed the yard and the many charactors, boats and buildings in the yard. Many a tale was told around each slide and many memories aired to the enjoyment off all. The ale flowed freely ago with burgers and chips, and the fact that it rained very heavily did not matter. Thanks Roy a real treat. On the Saturday night again all of the crews again attended, joined by many who came by car. Food in the form of a buffet was again laid on by Joan Kenn, for those who did not join in the traditional BCNS Barbecue. With the real ale flowing freely the entertainment of Stan Stephen's Jazz group followed Black Country Comedian "Marlene" made the evening go with a swing (althought I'am not sure everybody who is not local would have understood everything Marlene said). But all to soon the night finished with Brian addressing the company, by floating an idea with everybody present about next years venue that he will address in the next news letter. 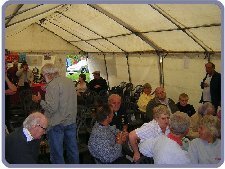 Like 2005 the weather threaten to spoil the event, the only shelter being a marque erected by our friends from the Thrupp Cruising Club. Well it did rain on and off during the day but did not spoil anything. 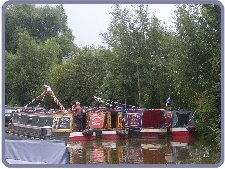 All the boats attending both the Thrupp annual event and the Allens Rally moored on both sides of the canal just before the sharp bend that leads to the lift bridge, that is Thrupp. 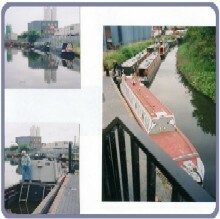 In the photo the Walsall contingent, the leading boats belonging to Roy and Joan Kenn, with Barry Kenn alongside. The Allens last boat Ellen is just behind. Mid day Saturday and the BCN crew arrived by car and brought Hazel and John Allen. Bob was unable to attend this year due to ill health and family matters, but he sent his best wishes. Hope you fell better soon Bob. 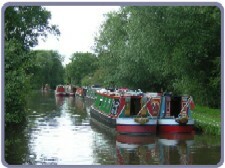 On the other side of the canal on the Thrupp Clubs moorings were yet more boats from the Allen Gathering. 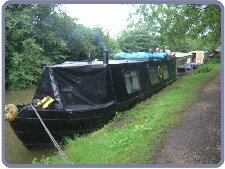 Three Allen boats with Druscilla: one in from the towpath, Ron Cousens boat on his way to the National on his annual cruise. 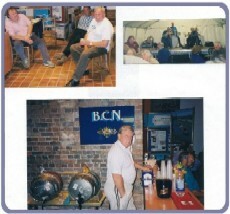 Ron took advantage of the gathering as a useful break in the journey, just what Bryan hoped boats off the BCN would do. A quick survey of the boats attending the rally and others moored in the area came to the total of thirteen Allen boats, not bad considering many were new boats to the gathering. As stated in the first photo the last boat ever built by the Allens "Ellen" was at the gathering. Now with new owners she has had a new paint job plus signing, and with all her brass work gleaming she looked a picture. During Saturday it became known that an Allen boat unknown to the register to date was moored nearby, not at the gathering. This boat caused some interest as the story that came to us was that it was possibly the oldest Allen boat yet found. A very hastily formed inspection committee was formed with John Allen as chair, all going on a boat trip to see the boat. 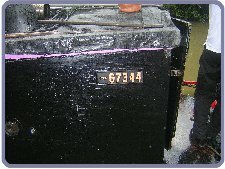 The boat the Black Pig was confirmed by John to be one of the first boats built in steel by them around 1968/9. Named Tranquility when first built she still appears to have her original wooden cabin, made out of half inch ply. Her new owner appeared dazzled by the attention his boat got stating that he was very happy with her and that she still sailed through her certificate inspections. We all left him in peace but not before inviting him to the evening event. 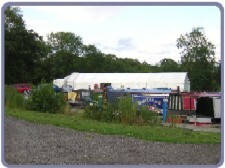 Thrupp Cruising Clubs land sits between the canal and the river Cherwell, entrance to the site being thro a gap in the hedge near to where Roy and Joan Kenns boat is moored in the first photo. 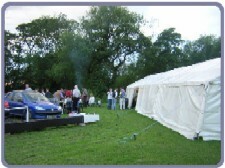 A group of tents had been erected to house the barbecue, bar and entertainment. As it got dark the proceeds started with the Group the "Goats" leading the festivies. The heavens opened but it did not damped the atomsphere, as the beer and songs flowed and in between the down pours the burghers were cooked, the coals never once going out. The Goats electrical equipment stood up to the drips from the tent as they passed around song sheets and simple instruments for us all to join in and make fools of ourselves. Eventually the rain stopped to rounded off a great evening. Raffles and simple speechs and presentations where made by Bryan who floated that he had ideas for next years gathering but he would confirm later. He was however seen talking to John Baylis so don't be surprise if Langley Mill is not in the running. 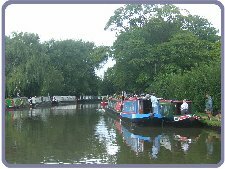 So those of us who came by car, departed on the night after long farewells, to leave many of the boats to depart over the next few days to attend the National at Beale Park. See you all next year hopefully where ever it is held. This event was planned to be a simple affair with the minimum of effort since we were to use the BW buildings for the event at Tardibigge. Its a long story that I'll leave Brian to tell in the next news letter, but just days before the event BW pulled the plug on us using the buildings. After many telephone calls the BCNS band wagon again hit the road and put up the Marque on the BW car park at the Wharf. It has to be said that the problems we had with BW where nothing to do with the local lads at the wharf who gave us every assistance, but rather the management at Peel Wharf who have lost the plot like the rest of the BW management since the last re-organisation. 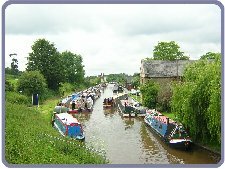 Regardless of all the problems from both BW and the weather, boats started to arrive filling the canal between the top lock and the wharf. Many boats breasted up making a friendly and compact site. 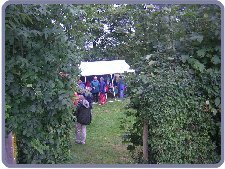 However a walk was required over the top of Tardibigge Tunnel via the road to enter the BW yard and the tents. 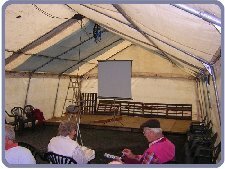 A burgher tent was erected and a stage erected in the main marquee, ready for the Friday and Saturday night entertainment. Friday night and the crews with both John with Hazel and Bob with Sybil Allen in attendence where entertained by a slide show. The slides of the yard and the BCN were taken in the 1950's and 60's by Peter Freakley who has been associated with the yard for over forty years. Peter was introduced to the yard when Les was alive and had some wonderful photos of Les and of Bob and John in their younger days. Many photo's of the Oldbury Area of the period certainly painted a picture of the lack of facalities at the yard and many of the wood working tools used prior to turning to steel boats. The burghers, beer and conversations around the slides made for a wonderful evening, a real eye opener for those present who never knew the yard and its charactors. Peters knowledge of the period was supplement by the Allens and others from that time, for Fred Heritage in the audience it brought back many memories of his working life, Fred and boats used by him featuring in some of the photo's. Fred and Sadie once again joined us bring Lynx to supplement our numbers. Saturday and the weather bucked up, following the rain strewn days before when putting up the tents. 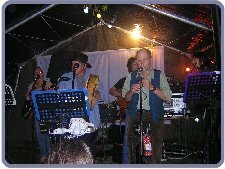 Saturday evening arrived, the crews and many visitors being entertain by 'Penny Short' the home grown group out of Hawne Basin who bring a support crew that swells any audience. As a result the tent was full the beer and food and entertaiment creating a great event. 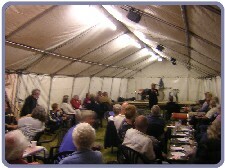 Moorers and locals attended too, a great evening was had by all. Again camera let me down on the Saturday hence no photo's. Sunday came as did the rain just in time to soak everyone as the tents where taken down, the BCNS circus moving to Titford for the following weekends annual summer BCNS gathering. 2008 who knows where, after this year Brian will need time to refect. Any ideas for a real trouble free event/location preferably not involving BW. Weekend 4th to 6th July 2008: Hawne Basin, Halesowen: BCNS. 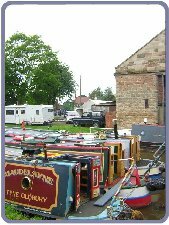 Well the gathering took place, a few new boats attended the gathering but many boats that regularly attend this year were missing. Like myself who actually moors at Hawne Basin the weekend clashed with other commitments so I was unable to attend on either the Friday or the Saturday. 2008 seems to be a year that many organisations and groups are holding anniversary Rallies etc the calender being very congested it has become difficult to attend many of them. Most of the boats that did attend, if not all managed to get a mooring inside the basin. I visited the basin on the Thursday and took a number of pictures of the new boats and a couple of boats that I have missed in the past. I will not publish the photo's of the Rally as they are just of the basin really, the new boats etc have been entered in the List section. From reports the beer went down well over the weekend, more poeple attending by road swelled the saturday crowd and a good natter was had by all. All I am told enjoyed themselves with several boats staying in the area and attending the BCNS 4Oth Rally on the weekend of the 12th & 13th July. Where we go next year is yet to be finally decided?. See News Letter Section for Bryan's report. 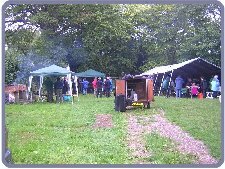 The gathering took place at Tardibigge linked to the 40th Annivesary of the Worcester & B'ham Canal Society. 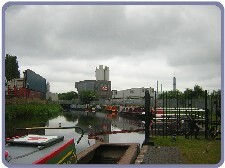 The boats moored at the wharf and the canal both above and below the top lock. 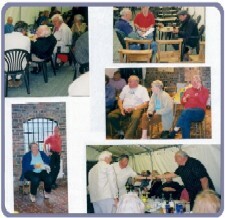 All of the functions took place in the community room attached to the church and school on the hill over looking the canal and wharf. A good time was had by all the Allen boats swelling the Anniversary Rally numbers. 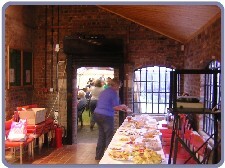 The 10th Gathering of the Register was to have taken place in July 2010 up on the Titford Canal at the BCNS HQ the Titford Pumphouse. But in April/May BW made the decision to drain Chasewater Reservior the main water supply for the BCN. This was because it had been found that the Victorian earth dam to the reservior had become unstable and required major work. A major consultaion took place with all groups and it was reluctantly decided to cancel a number of Rallies on the BCN to conserve water. Our rally fell into a group of Rallies that BW were unsure if they could maintain water supply especially being on the summit of the Titford. BW stated that they could support one rally on the summit so it was decided to support the BCNS gathering and invite any Allen boat who wished to attend. In the event some boats made the rally but many could not. A real shame as Bryan really wanted a good turn out being the tenth Gathering. Note:- The annoying fact that in August 2010 with BW having drained Chasewater early in the season Lichfield Council who owned the reservior (BW have the right to extracted water for the canal) have not even worked out funding let alone started the job. In reflection Chasewater could have been slowly emptied over the summer allowing all of the rallies to have taken place. But there again hindsight is an exact science. 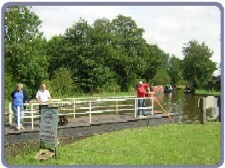 The cruising and rally scene on the BCN in 2011 is in some difficulty as even if the work is completed over the winter 2010/11 it is estimated that it may take about two to four years of normal rain fall to fill Chasewater.